Taking control is important when it comes to money matters, and personal loans can be a smart solution for taking the financial bull by the horns, you might say, in a variety of financial situations. While many people use them to consolidate debt, you can also use them for home improvement projects, weddings, vacations, medical expenses and more. To make progress on managing debt, first you need to size it up. Start by determining the amount that you need and how much you can afford to borrow and confidently pay back. Use our debt consolidation calculator to add up your debts that you’d like to pay off. See if you could potentially save money by consolidating the debt and at what estimated interest rate. You can also use our personal loan calculator to estimate monthly payments. When consolidating credit cards or refinancing an existing loan, you want to be sure that the math adds up in your favor. If you can lock in a lower interest rate, have only one single monthly payment, and perhaps pay off debt faster, then that sounds like a pretty good plan. We understand debt consolidation can seem difficult, which is why a choice of loan terms can make it seem more manageable. The loan term defines how long you can take to pay back the loan. This allows you to pay at a pace that’s comfortable for you, while knowing your target payoff date from the start. If you’re financing a major expense, like new kitchen appliances, new windows, or an engagement ring, consider how much more a personal loan payment will factor into your monthly expenses. What are the Most Important Factors to Consider When Choosing a Personal Loan? According to an independent, national survey of 2,000 adult consumers, the most important factors when choosing a personal loan are overwhelmingly the trustworthiness of the lender and interest rates. 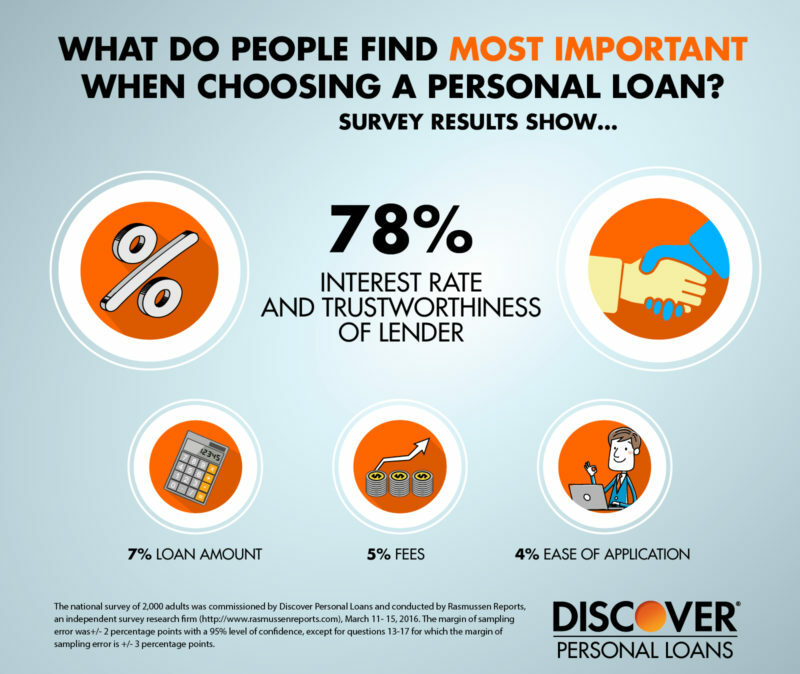 In fact, 78 percent of adults indicated that those two factors—trustworthiness and interest rates—were the top reasons for selecting a personal loan provider. We think it’s also important to consider Annual Percentage Rates (APR) and any fees, such as origination fees. Hidden loan fees can increase your APR. People look for personal loan lenders they can trust. While a competitive interest rate typically factors into a borrower’s decision, the majority of survey respondents would evaluate potential lenders on more than just proposed rates. They want a lender who can guide them through the application process, alleviate stress by providing clarity during the origination of the loan, and then be available throughout the life of the loan to answer questions. Don’t forget, when you get a personal loan, you are entering into a multi-year relationship from start to payoff with a lender. Getting a personal loan is a decision that can affect your financial future, so many consumers agree that it’s important to fully and easily understand the terms of their loan. This is another possible reason why the trustworthiness of the lender was so important to survey respondents. Consumers are looking for full transparency and clarity from their lender when considering their loan provider. The fine print of some lenders may include hundreds or even thousands of extra dollars in cost due to variable interest rates or origination costs depending on the size of the loan. Check if a lender, for example, has fees, like origination fees or closing costs. For instance, if a lender has a 6% origination fee and the loan is for $10,000, then the borrower would pay $600 just for originating the $10,000 loan. If you compare the cost of having multiple higher-interest bills to one loan with a lower interest rate, the math simply makes sense. If the combined interest rate on your higher-interest debt is higher than a personal loan, you could save hundreds, possibly thousands, on interest by consolidating it into a lower interest rate loan. Fixed interest rates are important as well because with a fixed interest rate, your monthly payment won’t change. Obtaining a lower rate can mean significant savings for you—especially when you compare the lower, fixed rate to the average variable rates of revolving debts. Customers should consider the total APR, not just interest rate. According to the Consumer Financial Protection Bureau, an annual percentage rate is a “broader measure of the cost to you of borrowing money. The APR reflects not only the interest rate, but also the points, fees, and other charges that you have to pay to get the loan.” The APR is often higher than your interest rate because some lenders add origination or other fees to your loan. Fixed APR rates at Discover range from just 6.99% to 24.99% depending on the creditworthiness at the time of your application. There are no hidden fees to increase your APR, so no surprises. It’s a good idea for loan seekers to check if their lender charges any origination fees and know the exact percentage charged. An origination fee is exactly what it sounds like, a fee charged by a lender upon entering into a loan agreement. It’s a fee just for taking out a loan. It’s important to learn if a lender charges any origination fees and know the exact percentage charged. Discover Personal Loans doesn’t charge an origination fee. Plus, there are no fees as long as you pay on time. So how much could be added to the overall cost of a personal loan if it has origination fees? It could be hundreds or even thousands depending on the size of the loan. 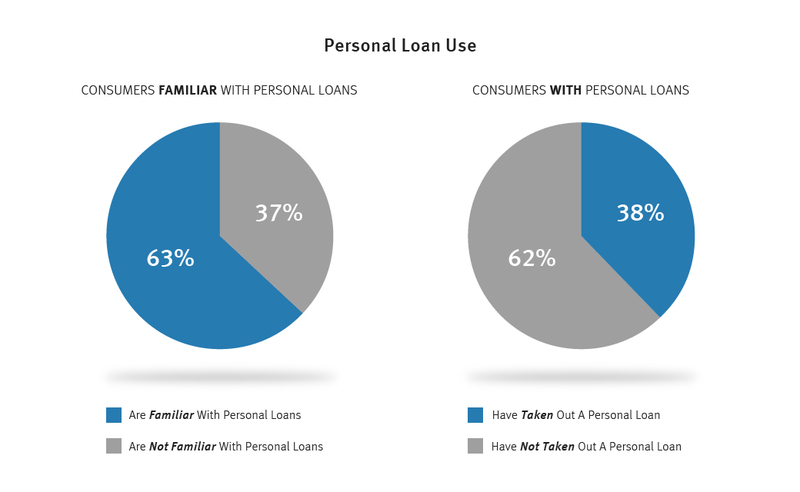 Who Tends to Take Out Personal Loans and Why? When trying to decide whether a taking out a personal loan is the right decision to make, it can be useful to review who tends to take out personal loans. So, who uses personal loans? Let’s take a look. One of the most common uses for personal loans is debt consolidation. As previously mentioned, debt consolidation allows you to combine several of your separate debts into a single loan with one monthly payment – usually at a lower interest rate, which would save you money. It’s convenient, sure, but it’s also a responsible and effective strategy for people looking to better their personal financial situation and eliminate higher-interest debt. After all, you can have a good credit score and still have debt. A personal loan can be used to pay for home repairs like fixing a leaky roof or replacing drafty windows, or for smaller home remodel projects. A personal loan is unsecured, so you don’t have to use your home as collateral to take out the loan, which can be very appealing especially if the repair is unexpected and you need funds fast. Since the loan is unsecured, the application and funds disbursement can be relatively quick and easy compared to secured loans. Weddings are increasingly expensive. But for some couples, the big day deserves the full treatment: the dream venue, an extensive guest list and an unforgettable honeymoon. In this case, a personal loan could be the ideal solution if you prefer to know exactly how much you’ll be paying per month and exactly when you’ll pay off the loan, provided you choose to have a fixed rate and term. 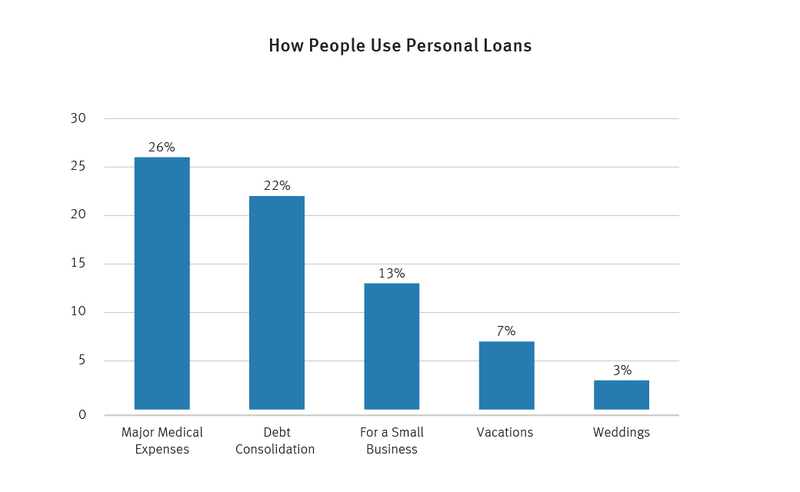 Small business owners use personal loans for a variety of reasons. New business owners may need additional cash flow as they start to grow their operations. Small business owners may use a personal loan to invest in new equipment or cover unexpected operating expenses. While there are loans available specifically for businesses, personal loans may offer more flexible options for smaller expenses. Another common borrower is the wanderer. Those consumed with wanderlust use personal loans to take care of travel expenses during their trip. Whether it’s used for air travel, lodging or entertainment, a personal loan can transform a vacation into a once-in-a-lifetime experience. This can be particularly helpful for those anticipating a bonus check, or other source of additional income, but want to take advantage of an earlier opportunity to travel. You never know where the next opportunity in life will pop up. Getting a new job in a different location can be expensive, especially if there’s lag-time before starting your new job. Personal loans can be a great financial solution for these exciting, but stressful, times to help cover moving expenses, which can be costly if your company doesn’t offer a relocation stipend. Along with finding out what types of people tend to take out personal loans, it may also be helpful to familiarize yourself with the amount of people who have opted to get personal loans. 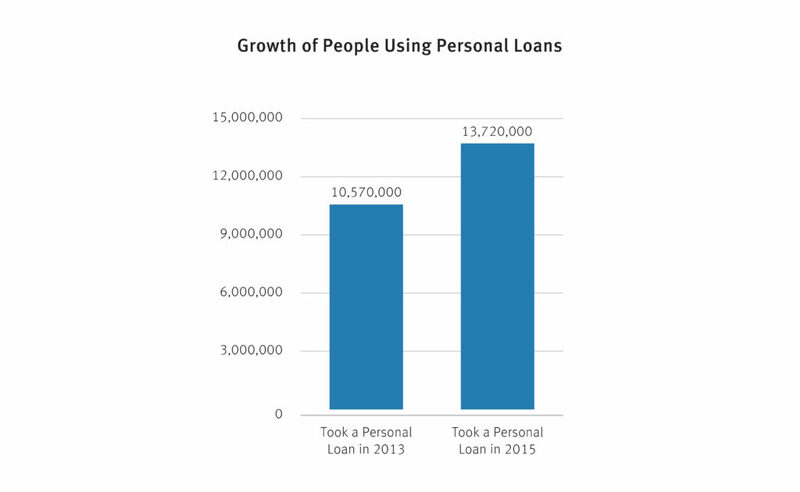 How Many Americans Use Personal Loans? Personal loans are becoming more and more common as consumers come to understand the many benefits. Discover Personal Loans’ 2017 survey found that 38% of respondents have taken out a personal loan, and 63% are familiar with the loan option. According to CNBC, citing data from TransUnion, the number of people using an unsecured loan increased approximately 30 percent in years, jumping from 10.57 million in 2013 to 13.72 million in 2015. In addition to the people who have already taken out a personal loan, many others are thinking about doing so in the near future. A Bankrate Money Pulse survey, conducted in January 2016 by Princeton Survey Research Associates International, noted that approximately 24 million consumers, or just about 10 percent of American adults, are “somewhat likely” or “very likely” to take out a personal loan in the next year. The 2017 Discover Personal Loans survey found that both the youngest and oldest groups surveyed named medical expenses as the most popular potential use of a personal loan. Just more than a quarter people ages 23-29 and 50-65+ both cited medical expenses as a top use case. For those 30-39 and 40-49, debt consolidation was the most common way they would likely use the product. Other reasons included vacations and weddings. While adults of all ages can use personal loans for a number of reasons, millennials in particular are interested in what this financial tool can do for them. Citing the same Bankrate Money Pulse survey, MarketWatch notes that 20% of adults considering a personal loan were between the ages of 18 and 29. When you combine a lack of savings with the technology prowess of millennials, it’s easy to see why consumers in this age group are turning their attention to personal loans. Do you have a major expense or multiple bills you’d like to get under one monthly payment? Preview your rate with a Discover personal loan up to $35,000 today. We offer fixed rates and no fees as long as you pay on time. Our 100% U.S.-based loan specialists are on call to help you every step of the way at 1-866-248-1255.